Featured stations provide a great way to explore and enjoy new music in a variety of genres. Also create your own custom stations, based on your pick of artist, song, or genre. See iTunes Match. WARNING: For important information about avoiding hearing loss, see Important safety information. Note: iTunes Radio may not be available in all areas. For more information about iTunes Radio, go to support.apple.com/kb/HT5848. When you pick a station and play a song, the Now Playing screen shows the album art and the playback controls. Tap to find out more, create a new station, fine-tune the station, or share it. See AirDrop, iCloud, and other ways to share. Create your own station based on an artist, genre, or song. 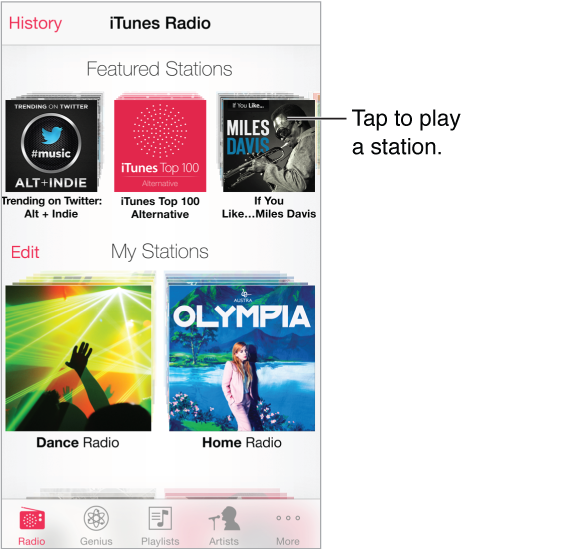 Tap New Station on the iTunes Radio screen. Choose a genre, or do a search for your favorite artist, song, or genre. You can also create a station from the Now Playing screen by tapping the Create button. Edit your stations. Tap Edit. You can include or exclude other artists, songs, or genres, or delete a station. Influence upcoming song selections. On the Now Playing screen, tap , then tap Play More Like This or Never Play This Song. You can also add the song to your iTunes Wish List. Skip to the next song. On the Now Playing screen, tap . You can skip a limited number of songs per hour. See the songs you’ve played, or view your wishlist. Tap History, then tap Played or Wishlist. You can purchase songs for your library. Tap a song to preview it. Purchase songs for your personal library. On the Now Playing screen, tap the price button. Share a station you created. On the Now Playing screen, tap , then tap Share Station. Listen to iTunes Radio ad free. Subscribe to (and turn on) iTunes Match. See iTunes Match.